Watersports and Activities :- South Africa has year round good atmosphere making it famous for sports such as squash, swimming,tennis, horse riding,mountain biking, golf etc. Sun City has laid out spectacular jogging trails. A wide range of water sports including Water-skiing, Parasailing and Sunset Cruises can be enjoyed at the Resort's Waterworld. 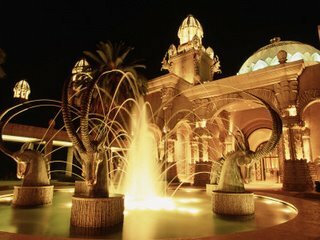 Sun City Nightlife and Entertainment :- Here famous artists perform throughout the year. Valley Of The Waves :- This is the most advanced water park in South Africa. This water park has five exhilarating flume rides.